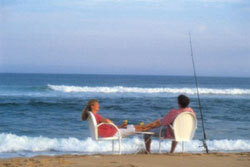 For the perfect romantic evening or weekend getaway, escape to the beach bed and breakfast. It the perfect place to celebrate an anniversary, honeymoon or simply your love for each other. Sip champagne, cuddle in front of the fireplace, or just enjoy the sound of the Atlantic Ocean. Welcome to the leading St. Simons Island Bed & Breakfast. Beach Bed and Breakfast has been voted the premier St. Simons Island B&B.